John James Fisher, Jr. was born on 9th October 1965, in Clarksburg, West Virginia USA, and is an American Football college coach, the current head coach of the Florida State University men’s team the Florida State Seminoles. He was also a football player in the past in the quarterback position, but without major success. His coaching career began in the late 1980s. 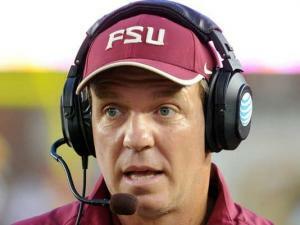 Have you ever wondered how rich Jimbo Fisher is, as of early 2017? According to authoritative sources, it has been estimated that Jimbo’s net worth is as high as $13 million, while his salary amounts to $3.6 million per year. Jimbo grew up in his hometown, and attended North View Junior High School, and then Liberty High School. After matriculation, Jimbo enrolled at Salem College, located in West Virginia., where he started his playing career, as he was the quarterback under head coach Terry Bowden. However, Bowden left the next year to coach Samford University team, so Jimbo also moved to Samford in his senior year, and was quite successful, earning Division III National Player of the Year honors. After college he ventured into professional football and played a season for the Chicago Bruisers of the Arena Football League (AFL), before he decided to pursue a coaching career. He became graduate assistant at Samford University in 1988 and was then appointed as the quarterbacks coach. In 1991 he became offensive coordinator for Samford, and just two years later moved to Auburn University, to train Auburn Tigers’ quarterbacks. He was slowly building a reputation for himself, and what is more important, his net worth started to increase. After Auburn, he spent a year at Cincinnati as offensive coordinator and quarterback coach, only to be hired in 2000 in same positions by Louisiana State University, where he stayed until 2006, thehelping LSU Tigers become a competitive team by developing college stars including Rohan Davey, JaMarcus Russell, Matt Mauck and Josh Booty, among others. Thanks to his success at LSU, Jimbo was soon sought by several other college teams, including the University of Alabama at Birmingham, however, after a serious of issues with the board of directors, Jimbo joined Florida State University as offensive coordinator and quarterback coach. Three years later he was named new head coach of the team following the retirement of Terry Bowden. Since then, he has led the Florida State team to one National Championship in 2013, one Florida Cup the same year, three ACC titles in 2012-2014, and four ACC Atlantic Division titles, 2010, 2012, 2013 and 2014. His tenure has included a 29-game winning streak in 2013-15, following a 13-0 record in the 2013-14 season. Thanks to his great results, he has received a new contract, which has certainly increased his net worth. Regarding his personal life, Jimbo was married to Candi Fisher from 1989 until 2015; the couple has two children. One of his sons has Fanconi anemia, a rare genetic disorder, which causes further health problems. 1 His son, Ethan Fisher, 8, has been diagnosed with Falconi Anemia blood disorder [November 18, 2013].